You know how you are exhausted when you come back from vacation? You think you should be refreshed from the break from your normal routine, but all that play tires you out. My friends Tricia and David took care of Dora while I was at my annual hiking trip, The Hen Hike, in northeastern Pennsylvania. They returned her to me a few minutes after I got home from the airport. I have never seen her so joyful. She was jumping and licking and even biting my nose and my chin. I think maybe she missed me. Even though she had a grand time at their house, playing ball several times a day and going on really long walks, she seemed to be worn out. Usually, when I unpack from a trip, my dog follows me around as I put things away, but Dora lay sprawled out on the bedroom floor and just watched me from there. I felt like lying down with her, I was so tired myself, but I’m rather compulsive about getting unpacked, doing laundry, and even taking a hot bath after a travel day. The hike this year was not nearly as challenging as it usually is. The trails were flat and free of rocks and roots. I sort of missed those kinds of trails. The most climbing I did this year was trudging up the 30 steps to my room on the third floor several times a day. 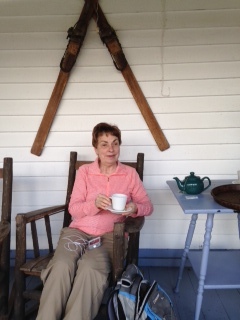 We stayed at an inn that was 105 years old, complete with fireplaces and a front porch with wooden rocking chairs. The fellowship was fabulous as usual. All 10 of us were seated together at 1 long table for breakfast and dinner, so there was always laughter and story-telling at each meal. We heard stories of recent trips and memories of extraordinary events, like being in a hurricane. One woman told about what it was like to be a child in Norway during WW 2. Another told a hilarious story of how she tried a marijuana laced brownie, and the paramedics had to come. 2 of our visually impaired gals described their adventures in parasailing. We are from all over the country and range in age from 50 something to 70 something. But we share our love of the outdoors, laughter, and adventurous spirit. One of the things that I love about women is our ability to find something in common, almost immediately. 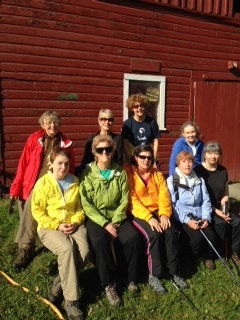 2 of our gals were new to the Hen Hike, but there was no problem in embracing them into the group. 3 of us have guide dogs, and we missed them fiercely, but normally, it wouldn’t be practical to have them try to guide us on skinny trails with drop-offs and boulders to climb over. Oh they would love it, but I could just see myself being dragged down the mountainside to chase a rabbit. So I’m guessing that the other dog guide handlers had a joyful reunion as well. We’re exhausted, so we must have had a wonderful time. When you get something for free, you tend to think, this is too good to be true. And then you find it is, that is, too good to be true. For a while this year, I had the envy of my blind friends. Once a week, a young woman from a home health agency came to my home and helped me with a few tasks around the house, running the sweeper, checking my clothes for spots, reading directions on cake mixes, things like that. The bonus was that she also took me on errands, including running to the bank, the drug store, the doctor, and even to clothing stores. We had a great time. She enjoyed helping me, and I was enjoying having the free service provided by Medicare. Sound like a dream come true? Not quite. Nothing is free. In order to get this service, I had to endure an annoying visit from a nurse, not once a month, not occasionally, but every single week. I protested that I am not sick. I am not injured. I am not recovering from surgery. I’m just blind. But the rule was that I had to have a checkup by the nurse every week, or I didn’t get the service. In addition, and even more aggravating was that I had to sign a paper stating that the “Aid” had worked 6 hours each week, whether she did or not. To make peace with myself, I tried to keep her busy for 6 hours. I didn’t need that much help, but rules are rules. The powers that be at Medicare say that if you don’t need at least 6 hours, then you don’t need help at all. What a crock. This meant that the aid was being paid for 6 hours when she only worked for 2 or 3. This is wrong. I finally decided that the obnoxious visits from the nurse and the deceitful paperwork were not worth the free help. I was told that I could offer to pay this young woman myself if I wanted to. OK, I thought. I can do that. I had a talk with her the next Monday and told her that I would pay her the same she was getting from the agency, but I would pay her only for the hours she worked, not 6. She was fine with that, but then, the agency barged into our little agreement and replaced me with another client for this aid. In order to keep her standing with the agency, she had to go with it, and her schedule didn’t allow fitting me in as well. So, here I am, back at square 1, recruiting friends to help and orchestrating ways to get things done. Stay tuned. I’ll figure this out.